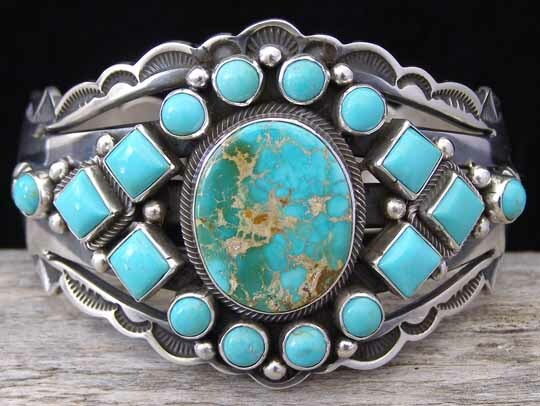 Aaron Toadlena Royston Turquoise Cluster Bracelet size 6 3/4"
This cluster design is set with a center oval of two-tone blue and green natural, untreated Royston turquoise from Nevada. Surrounding the center stone, squares and rounds of clear blue Royston turquoise form a patterned cluster of stones punctuated by raindrops interspersed between the stone settings. The cuff itself is split into five narrower bands behind the clustered array of stones and is slightly convex on the sides. Aaron's large-pattern stampwork decorates the cuff to the terminals, while accenting stampwork traces the sculpted edges of the cuff. This is a classic design for which Aaron is well known and those familiar with his work recognize his designs immediately. Hallmarked Aaron Toadlena and stamped .925 to indicate it is made from Sterling silver. Width of cuff dead center: 1 3/4"